With the architect’s first schematic design only weeks away, Vikings officials and members of the public authority supervising the project are at odds over how to squeeze a baseball field into a stadium designed primarily for football. “The problem is you can’t put a diamond in a rectangle,” said University of Minnesota baseball coach John Anderson. His team hopes to take advantage of playing in the new downtown Minneapolis facility that will replace the Metrodome, which for decades has served as a warm and dry venue for hundreds of college and high school teams seeking an early start to the baseball season and refuge from nature’s worst. “Something’s got to give,” Anderson said. The Vikings, hoping to put ticket holders and stadium suites as close to the action as any team in the NFL, favor a preliminary design that places the first row of seats 44 feet from the football playing field. Only one other recently built NFL stadium — Lucas Oil in Indianapolis, designed by HKS Inc., the architect for the Vikings stadium — puts ticket holders that close. But that design squeezes some baseball dimensions. Okay, first of all, I think this is a non-dispute from a stadium design standpoint. 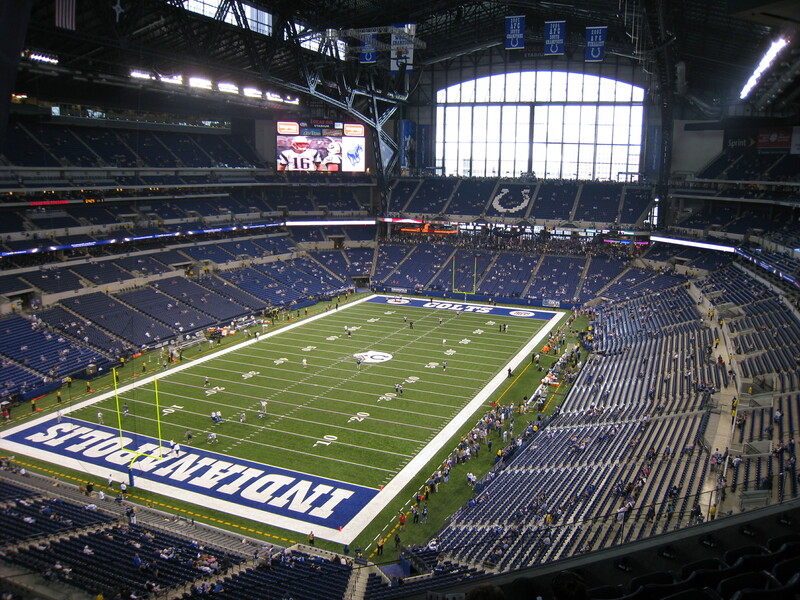 Look at this image of the oft-cited Lucas Oil in Indy. Look closer. See how there are silver-colored floors under a bunch of seats on the field level? That means they fold up on both sides of the field. Conservatively, you could fit a 280-foot baseball foul line between those seats. With creative design or angling of the field, you could easily up that to the 300 feet the U has said it wants. Not a fan of $900 million publicly funded stadiums? A lot of economists are on your side. But the argument isn’t about building a stadium anymore. From an economic perspective, being a major league city sometimes involves throwing good money after bad. I feel for baseball coaches. I’m a baseball guy. I’m no great fan of the Vikings. I think the Vikings should make some reasonable accommodations. But not at the expense of the stadium’s overall design. Taxpayers are spending a lot of money precisely to get rid of a multi-purpose stadium, not to re-build one. It would be nice if that money paid for building that actually honors the state that financed its construction. The wrecking balls that smashed the Kingdome, Cinergy Field, Three Rivers Stadium or Veterans Stadium can tell you what happens when you favor function over form in stadium design.